Lawmakers in both the State House and Senate are considering measures that would enhance the penalties for texting while driving and also make it easier for officers to pull over motorists in these situations. Both Senate Bill 144 and House Bill 69 designate texting while driving as a primary offense, so officers may pull over motorists solely for violating the enhanced cell phone law; “texting” in this context means sending or receiving any text-based communication, whether it be a text, email, or social media post. Senator Rene Garcia (R-Hialeah) likened S.B 44 to the seat belt law, and predicted that the measure may reduce distracted driving-related crashes in the same way that primary enforcement of seat belt laws drastically reduced roadway fatalities. 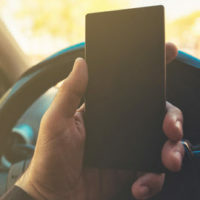 However, he admitted that a texting-only ban is difficult to enforce, because in court, prosecutors must prove that the driver was texting at the time, and this evidence is not easy to obtain. Furthermore, the House and Senate bills would both increase the penalties for texting and driving, particularly in school zones. The current cell phone law is hardly ever enforced, and in fact, University Police at the University of South Florida issued zero cell phone citations in 2016. Even after a driver puts down a device, the driver is still dangerously distracted for an additional twenty-seven seconds. Almost anything can distract drivers, even something as everyday as adjusting the air conditioner or talking to a passenger. Cell phones are the most worrisome form, because they combine all three forms of distracted driving: mental (taking one’s mind off the road), manual (taking one’s hand off the wheel), and visual (taking one’s eyes off the road). Sending or viewing a text-based message while driving is negligence as a matter of law; in other distracted driving cases, Florida victims must establish that the tortfeasor (negligent driver) was so distracted that s/he breached his/her legal duty, and that breach caused the victim’s damages. “Permanent” injury, a very broad category that includes many different kinds of wounds; in this context, “permanent” really means long-lasting. Additional punitive damages may be available as well, if the tortfeasor consciously disregarded a known legal duty. Distracted drivers are legally responsible for the damages they cause. For a free consultation with an experienced personal injury lawyer in Brandon, contact Reed & Reed. We do not charge upfront legal fees in personal injury cases.